. Papermachee Dolls　張子 hariko . They have their own "Doll Museum".
. Kaishi 懐紙 folded paper, "pocket paper" .
. Kamibukuro 紙袋　Paper Bags and envelopes .
. Kami tsubame 紙つばめ paper lark .
. Origami Daruma 折り紙だるま .
. Washi, Japanese Paper 和紙 - Introduction . votive tables of horses made of paper .
. Keshoobako 化粧箱 cosmetic box .
. Odawara choochin 小田原堤灯 lanterns from Odawara .
. washi ningyoo土佐和紙人形 paper dolls from Tosa washi . These lanterns are made solely of paper and are said to be the acme of paper craft. 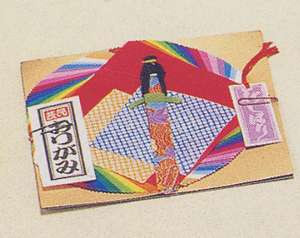 They were originally for festival use, but recently they have become popular as souvenirs.
. uumen ウーメン（紙びな）hina dolls from paper . While mention is made of Sekishu in the Engishiki, a Heian period (794-1185) document on court protocol, a more direct reference to paper is made in the 紙漉重宝記 Kamisuki Chohoki, a ""A Manual of Papermaking"" published in 1798. 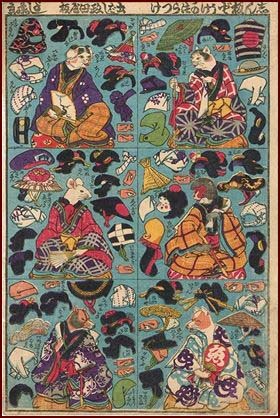 It says that when 柿本人麻呂 Kakinomotono Hitomaro went to take up the post of protector in the province of Iwami (Shimane prefecture), he taught the people there how to make paper. has been made unceasingly for about 1,300 years. In the early days it was made by farmers in their spare time but gradually became a specialized job of work and today, paper is still being made using the same skills and techniques as of old. differ slightly depending on the plant fiber source. The long fibers of kozo paper make it really strong and supple. 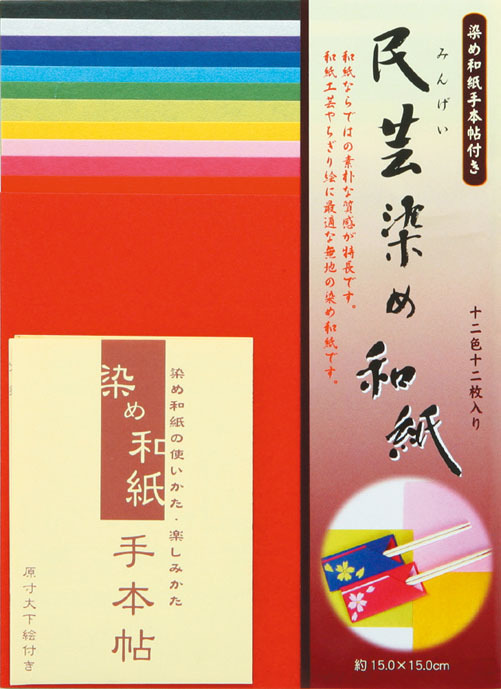 Also beautifully pliant is mitsumata paper which is taught and has a slight luster. Even more pliant is ganpi paper which is glossy and is not preferred by hungry insects. Produced in large quantities, kozo paper was used in the past for ledgers by merchants, who were quick to throw them down their wells if a fire broke out, knowing the paper was strong enough to withstand a dousing. 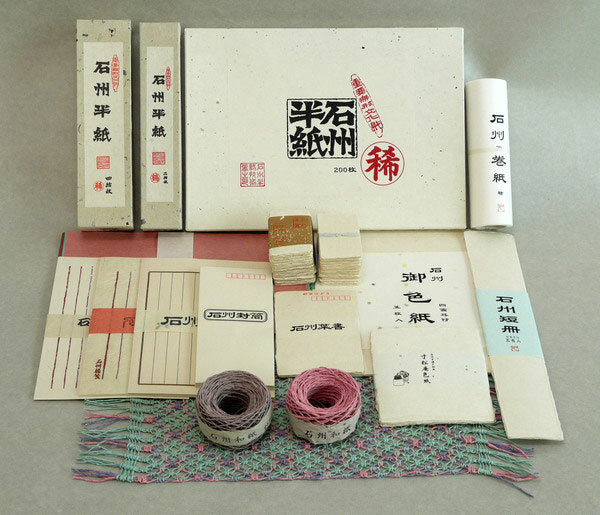 These days paper is made for shoji screens, calligraphy paper, letter paper, envelopes and postcards, and business cards and many other things that all retain a distinctive character. ... In light of the unique traditional techniques and methods employed to make Sekishu-banshi by the Sekishu-banshi Craftsmen's Association, Sekishu-banshi was designated as an Important Intangible Cultural Property in 1969.
. Kakinomoto Hitomaro 柿本人麻呂 Hitomaru 人丸 / 人麿 (c. 662 – 710) .
. kami kanbutsu 紙冠物（かみかんぶつ Helmet from paper .